11 3D blocks,6 animal sounds,8 scales,8 music,colorful colors,a variety of different fun activities! 1. [FINE MOTOR SKILLS]-Embedding the block in the room,opening the door with a key,moving the colorful beads and squares all help to exercise your baby’s finger flexibility and fine motor skills! 2. [VISUAL DEVELOPMENT]-Infants can recognize shapes,colors and animals from the box,which will stimulate the baby’s visual development. 3. 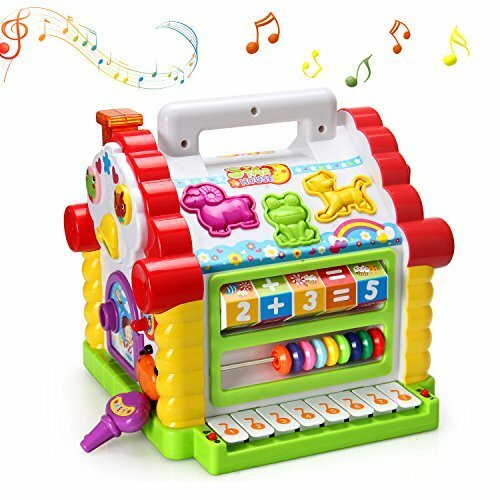 [ORFF MUSIC-HEARING DEVELOPMENT]-Baby can learn beat and rhythm by playing piano keys,hear wonderful music and stimulate baby’s hearing development,which can cultivate baby’s musical interest. 4. [TACTILE DEVELOPMENT]-Touch Blocks to learn the size and shape of blocks. When the toy is not in use,remove the battery. WE BELIEVE THAT THIS IS YOUR BEST GIFT CHOICE FOR YOUR BABY.▲ANIMAL & SHAPE BLOCKS:5 geometric shape blocks and 6 animal blocks,you will hear the animal sounds when embedding the animal blocks into the house.Through this game baby can learn to identify the shape,color,animal.This will stimulate the visual development,improve the baby’s fine motor skills.